After bringing in Commander, our perlino quarter horse stallion, to breed to our Arabian mares we continued to add some AQHA cremello and perlino mares to our broodmare band. They have delighted us with their laid back temperaments and bright blue eyes. Our focus continues to be on performance bloodlines that can excel in reining, western pleasure and trail. Our mares have good bone, conformation, a pretty look and the traits of a good breedable horse who conceives easily, foals well and is a good nurturing mother. "Starrie" is a wonderful perlino mare sired by the great 3 time world champion reining horse, AQHA Hollywood White. Good bone, nice conformation and the sweetest of temperaments make Starrie one of our AQHA favorites. 1997 NRHA Limited Open World Champion Reining Horse, and 1996 NRHA Limited Non Pro Reserve World Champion Reining Horse. Many of the Hollywood White get have been exported to Australia, Europe, and Mexico where they have become champions themselves. had over $41,000 in earnings, 345+ AQHA points and was an NRHA money earner and a AQHA Super Horse contender three times. Starrie's dam, Hollywood Hot Streak, is a daughter of Hollywood Heat who had over $41,000 in earnings, 345+ AQHA points and was an NRHA money earner and a AQHA Super Horse contender three times. multiple ROM producer, Centurion Command and adds nice old west coast champion bloodlines from the excellent breeding program of Barb McLean to Holly's background. 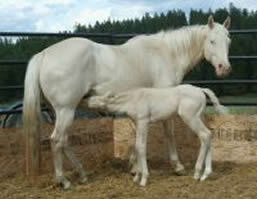 Starrie, being a perlino, will produce 100% palomino and buckskin foals. 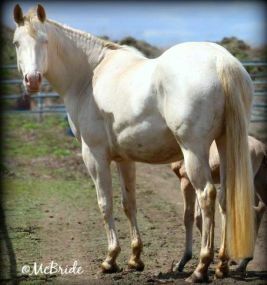 "Blondie" is a cremello mare with great balanced conformation, good bone and a pretty look. Her sire BigMacTivio, came from old working range stock bloodlines in CO. Her dam, Double Cross Word, brings in some of the best old racing lines of Three Bars, Jackstraw and Double L Straw along with Blondy's Dude. 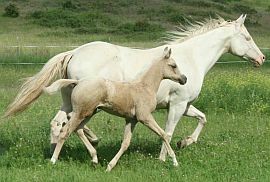 Shown with her 2007 colt, Hollywood Color by Hollywood White. "Missy" is our tallest cremello mare at 15.2 hands. Tall, elegant and with a long shapely neck and pretty head, Missy has nice movement and a very sweet temperament. Bred from a long line of quarter horses she has many crosses to Three Bars and produces long legged elegant foals. 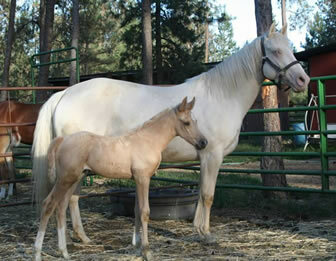 Shown with her 2007 half Arabian palomino filly by well known Arabian stallion, Bachelor Bey. "Jazzy" is the dam of our perlino stallion, Commander. A very nice smokey black mare, she is the first mare in the pasture that catches quarter horse breeders eyes. Bred by the late Barb McLean, she comes from a very well known west coast breeding program known for excellent performance horses. Jazzy gave us a superior cremello filly in 2008 by Vanilla Zip. Pretty, long legged and extremely sweet, Zippin Creme will enter our breeding program to cross on Arabian stallions for dynamite palomino half Arab foals. "Vanilla" is a nice cremello mare with many crosses to Skipper W. Nicely balanced, good bone and a willing disposition she crosses extremely well with Arab stallions. 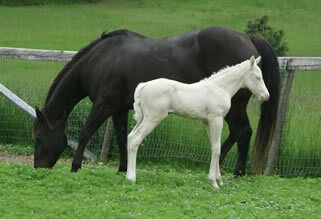 Pictured with her 2007 filly by a Bey Shah bred Arab stallion. Vanilla is unregistered and avaiable for sale. Breed her to a chestnut Arab stallion and get your own gorgeous palomino foal!